This is the largest size slim line storage unit on the market. It is 3.75m meter long and you’re certainly saving big by not having the back wall panels on such a large size. This unit is called the 'Off The Wall' shed, as it is designed to be placed against the wall of a house or fence. Going right against the wall, in many situations the back wall is not really needed (depending what you’re planning to store in the shed) and now we have a solution for these cases. If you don’t need a back wall, you simply don’t pay for it, saving big dollars. 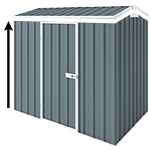 Shed comes with wall anchors (for steel or masonry) included and has 20 years warranty. This model is also available in Colour Steel here. Can you put the door on the end as I have a narrow space between my existing garage and fence.